I don’t know about you, but I both look forward to and dread spring cleaning. I love the way the house feels when I’m done, all fresh and new and ready for the warmer months. What I don’t really look forward to is the time I have to spend making it feel that way. 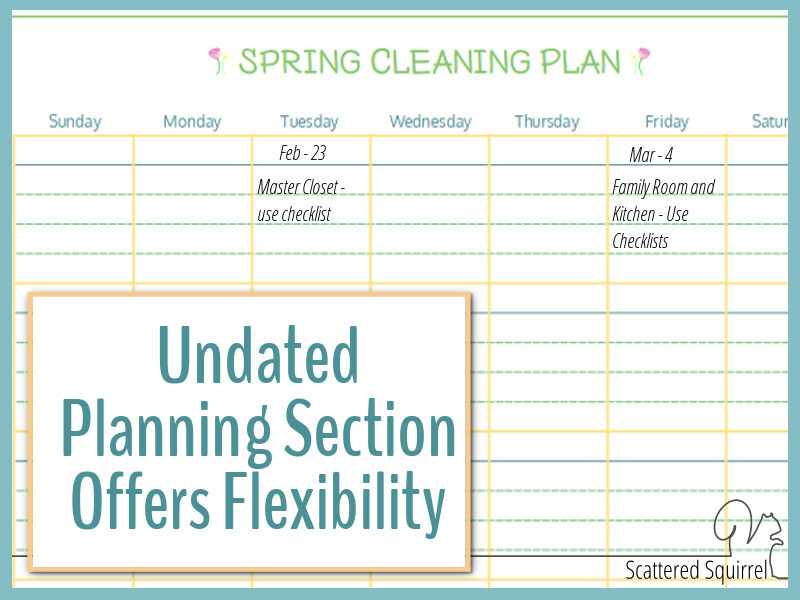 Last year I shared my scattered-brained approach to spring cleaning, this year I’m hoping to be a little less scattered and more prepared for the onslaught of my seasonal cleaning. Having the right tool for the job always makes the work more efficient, and when it comes time to do my spring cleaning I really need things to run as efficiently as possible. I don’t want to be wasting time when there is so much that needs to be done. Over the years, I’ve slowly built up a rhythm to my season cleaning and it all centers on having the right tools to get the job done. I’m going to kick things off by sharing my number one most favourite cleaning tool ever! Microfiber cleaning cloths are my go to cleaning supply. They clean everything, work well on any surface, and I absolutely love that for quick cleaning I don’t even need to use a cleaner just a little water and one of these. This year I’m hoping to stock up on enough of them to finish outfitting all the bathrooms with nine each. That might sound a little crazy, but with how I speed clean our bathrooms, they would be a big help. It’s very similar to the one my mom has, and I love hers. I like that it’s versatile enough to use in various areas without needing to have a variety of different attachments or needing to have a couple of different dusters to do various jobs. Spring is also a great time to clean out your dryer vent. This task should be done at least once a year if not more, to prevent a fire. When I was little, younger than my youngest is now, there was a fire behind the dryer in our home. I remember seeing a weird light behind the dryer and tell my parents about it. I remember sitting in my room with brother while my parents dealt with the fire, which they were thankfully able to extinguish on their own. I don’t remember being scared, but it’s something that has stayed with me my whole life. I don’t run the dryer when I’m not home. I don’t dry clothes in the dryer while I’m sleeping. As a child, I didn’t really understand, as an adult that memory terrifies me. If you only tackle one cleaning job this year, make it this one, please! Pick up a dryer cleaning kit, they’re fairly inexpensive and take the time to clean it out. For me, the heavy duty cleaning is tackled with two tools. The first one is my Rubbermaid Reveal Mop. I love this thing. I could rave about it for days. It’s almost 6 years old now, and it is still going strong. I use it almost every day. We first picked it up when we lived up north and our home had no carpets. I wanted something that would let me keep the floors dust free and allow me to spot clean each day so the weekly floor cleaning wasn’t too bad. I love that this mop lets me use my own cleaner and mop heads can be washed and reused. I won’t ever buy another mop. As a total bonus, it works great for washing the walls too! My next favourite spring cleaning tool is my vacuum. I love my vacuum, but what I love best about it is that it’s not only bagless, but the filter can be pulled out and cleaned. Which means we’re not spending money replacing it every few months. We were given our vacuum from a friend of ours, and it’s about 5-6 years old now and it still works wonders. It does a better job of vacuuming than the built central vac does. I don’t plan on replacing our Bissel until my oldest moves out, and I’m pretty sure I’ll be replacing it with another one. A good vacuum is such a blessing. Keeping cleaning supplies organized helps make the work go faster. Being able to grab what you need without hunting for it is awesome. I use caddies to keep my rags, cleaners, and other supplies all neat and tidy. I love that I can just grab the caddy and go do my cleaning. This year I’m toying with adding a ‘tool’ belt like the one pictured above, to my shopping list. I like the idea of having the supplies I need right there ready to grab, regardless of what room I find myself in. As far as I’m concerned that’s the only drawback to a standard caddy when doing the seasonal cleaning – you have to keep dragging it around from room to room with you. It’s also a great time to replace your toilet bowl brushes. Ideally, these should be disinfected every month, but after a while, it’s good to replace them. The better quality brush you invest in, the longer it will last. I keep one in every bathroom for quick cleaning. There are so many amazing ideas and tips and tricks out there on Pinterest and all over Blogland, but I find it’s always nice to have a few trusted, go-to resources for various things. Cleaning my home is no different. Below are the two books I seem to reference the most when I’m getting ready to tackle a big cleaning project like spring cleaning. Flipping through for ideas, recipes, and instructions sometimes help me focus better on the job at hand. My final favourite tool will come as no surprise to anyone – it’s a planner to help me stay on track. Each year I seem to tweak this system a little more, and I’m eager to give this one a try this year. 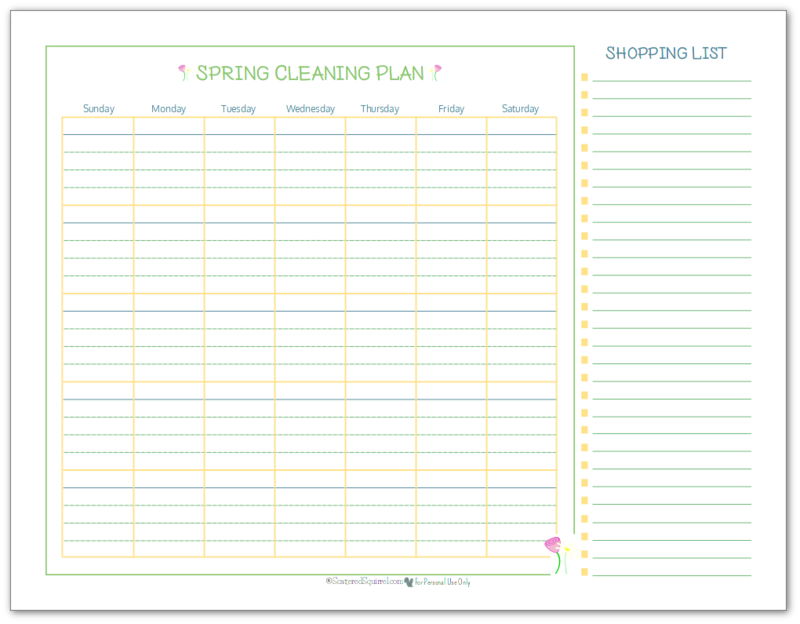 I wanted something that would let me plan when to tackle certain tasks and rooms. With busy schedules, it’s crucial that I create some kind of plan or it will never get done. I also wanted something where I could keep track of what supplies I need to purchase for the cleaning this year. Whether it is ingredients for making my own cleaners or baskets and bins to help organize problem areas, I wanted to be able to keep them all in one place. The nice part of having the list section on it is that I can just cut it off and take it with me to the store when we go. Here’s a closer look at the planning section. I purposefully left it undated so that it could be as flexible as possible. As you can see in the picture above, I was able to skip a whole week without having to leave one whole line blank. My plan is to tackle the cleaning in bits and pieces, and not overload myself with trying to get most of it done on a single day. This allows me to do just that. As always, if you would like a copy of the printable for yourself, simply click get the PDF. I can’t say that I truly look forward to spring cleaning, but I fo love how my home feels when I’m all done. There is something so refreshing about everything being all clean and spruced up. I do know that the tools I use truly do help make the job a little bit easier, and for that I am truly thankful. 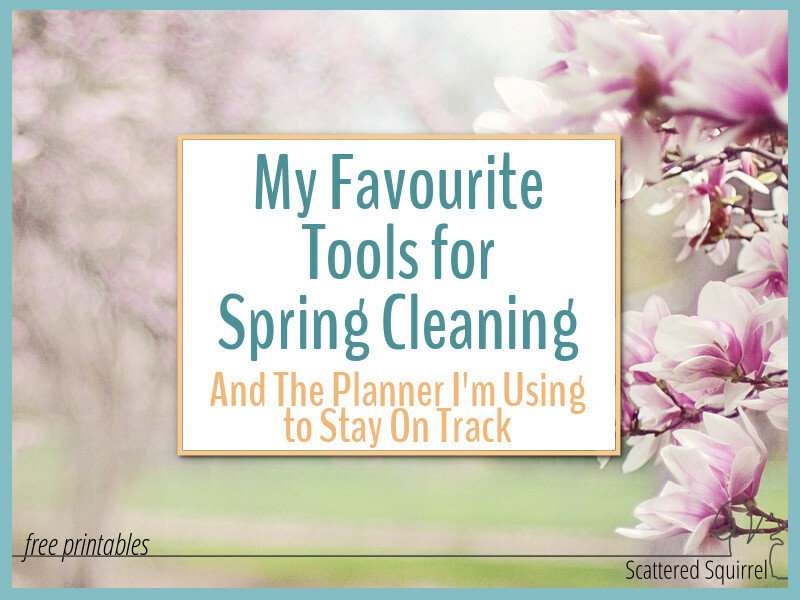 What cleaning tools are your favourites? Is there something I missed in my list? Dryer fires scare the crap out of me! Especially since it’s not something you’ll be able to see until who-knows-when…which is why I never have the dryer on when I’m not home. But, then again, the dishwasher, washing machine, or anything else is not on while I’m out of the house 😉 I’ve left the oven on once longer than I should have (though it was discovered when we were dishing up our food) and even that scares me a bit.